With what do you associate the Italian capital of fashion? With La Scala, Duomo or Galleria Vittorio Emanuele? Someone definitely remembers of “The Lord’s supper” and the experimental technique of painting by Leonardo or the architecture of the Art Deco of the Mussolini period – but this is not all the cultural codes of the center of Northern Italy. Modern Milan is the center of industrial design and production, Rossana Orlandi Galleria, 10 Corso Como multi-brand boutique, Fondazione Prada, the works of Alessandro Mendini and Patricia Urquiola. 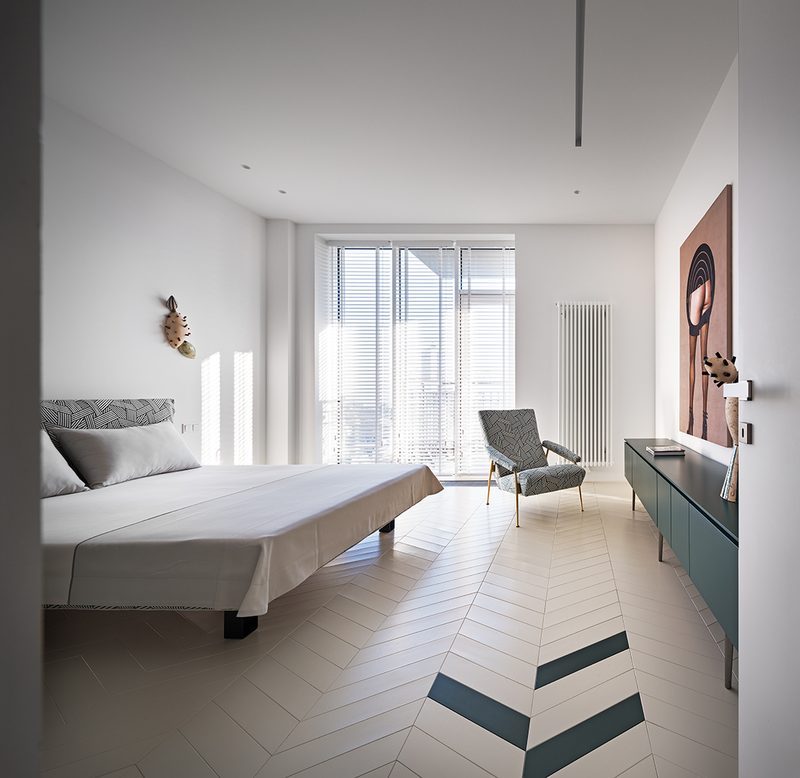 The art, design and image of the modern city were chosen by Yuriy Zimenko as a starting point in the design of an apartment in the center of Kyiv. But nothing would have worked out, only for the customers family. The design intent seemed rather standard: a new house, an open space planning that does not restrain imagination, the total area is slightly larger than the average – 120 sq.m. What was non-standard is the decision of apartment owners. They knew exactly what they wanted and did not even plan to accept any compromises. 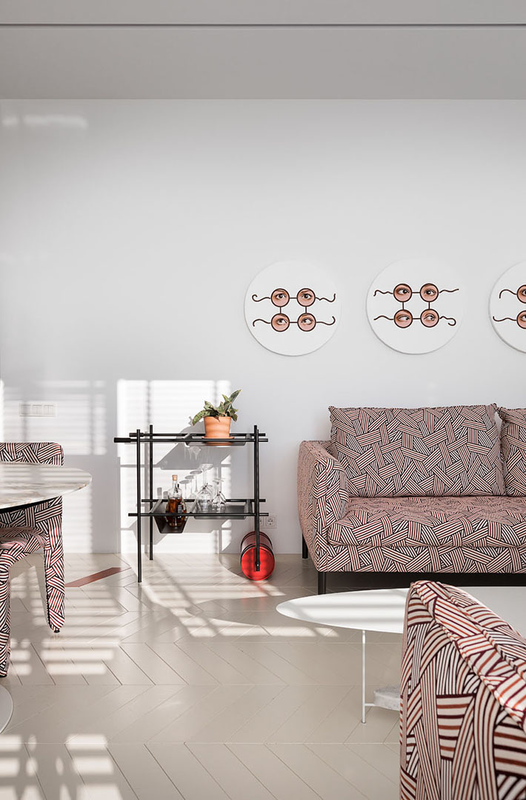 Having been travel extensively (including Milan), customers of Yuriy Zimenko dreamed that their own home reminded of the emotions that arose during the trip. The designer's choice for such a responsible task could not have been accidental. 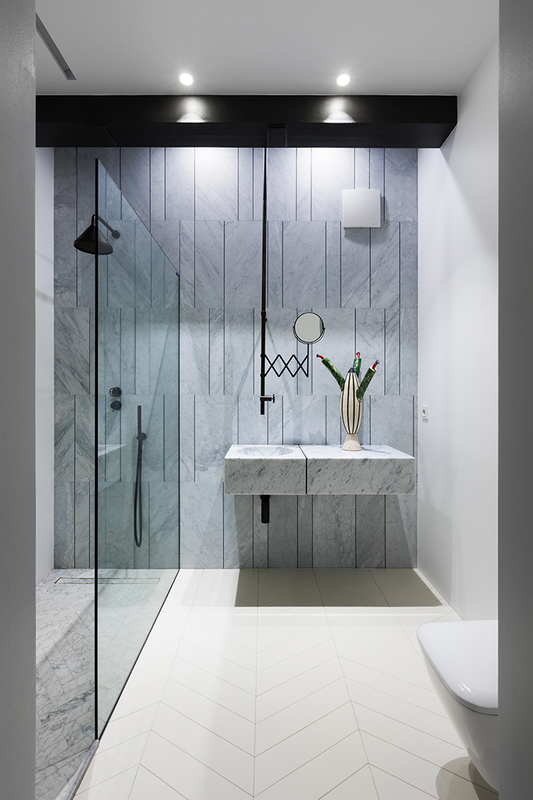 Therefore, before contacting the Design Studio of Yuriy Zimenko, the apartment owners carefully studied the portfolio of Ukrainian studios, and when decided, they immediately found a common language with the future author of the interior. “I've long dreamed of an art experiment in the living space. About such that happens in the practice of my Italian colleagues. However, clients, as a rule, were not ready to take risks. This time it turned out vice versa and namely customers insisted on some ideas. White color, absence of unnecessary details, visual ease of the furnishings – all are their wishes. Such vision of the project completely coincided with my ideas. And when you and your customer are on the same page, work is easy and interesting,”- shared the designer. 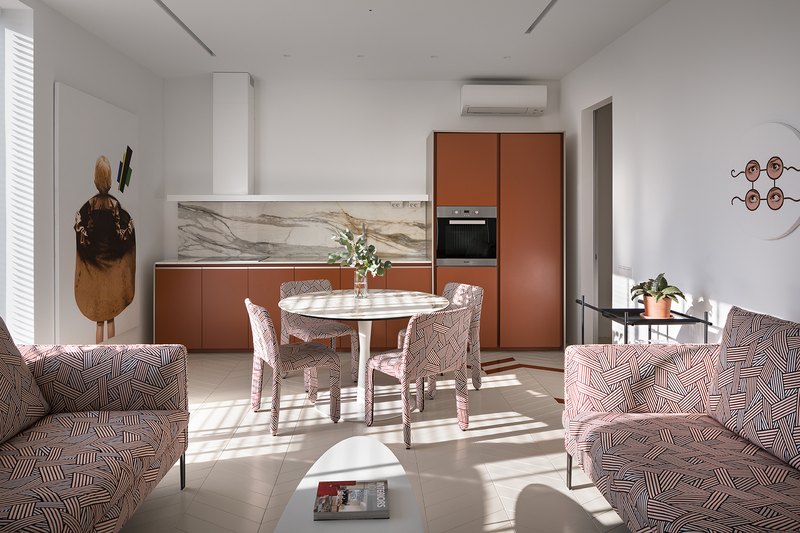 The concept of the interior is based on asceticism and minimalism, but let it not misguide you: the close connection with art in the space of the apartment is traced almost in all things. The snow-white walls served as a great background for the home exposition and resemble museum spaces of Fondazione Prada. Even the floors became a place for the creative experiment. 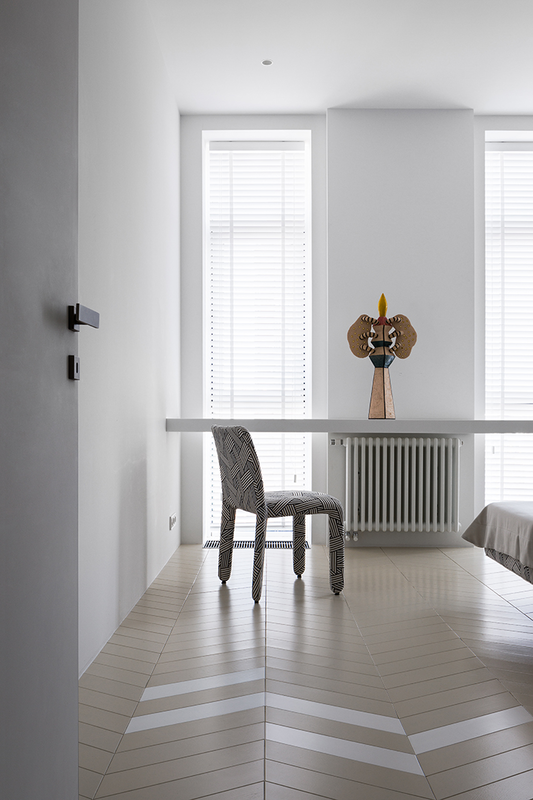 Parquet board painted in milky-white is laid with classic French herringbone. It would seem that nothing unusual. However, there are colored spots on the parquet in each room. In the corridor – red, in the bedroom – green, in the living room – orange. This is a well-thought-out tactics, since such accents correspond to the tone that dominates in space. To increase the pattern effect on the floor, all the furniture was raised on elegant feet. 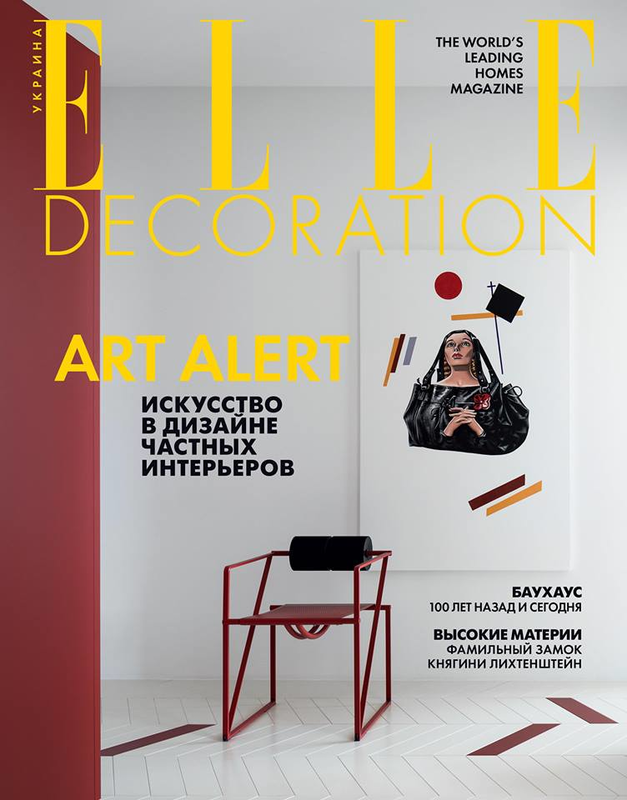 And for visual complexity the project was imbued with graphic prints and art objects – ceramics by Lesya Padun and painting by Ruslan Vashkevich. According to Yuriy much of this project resembles Milan apartments of the 60’s of the last century. In its turn, Modern Milan is easily perceive in cabinet and seating furniture. “The works in the interior ended a year ago. After a pause and assessing how much space suits their owners, we decided to show what we succeeded. Now we take our work impassively and realized that we did everything correctly”- says Yuriy Zimenko. As a guide with many years of experience, in his work he introduces each of us to his favorite places and images of Milan.